Ocean plastic can persist in sea surface waters almost indefinitely, eventually accumulating in remote areas of the world’s oceans. Researchers at The Ocean Cleanup, an NGO dedicated to cleaning up the earth’s seas, recently published (Nature, 22 Mar 2018) the results of a three-year study to determine the size of the Great Pacific Garbage Patch (GPGP). The results are alarming. The largest accumulation zone of ocean garbage on the planet is much larger than anyone thought. It measures 1.6 million square kilometers (three times larger than the size of France) and contains an estimated 1.8 trillion pieces of plastic weighing an estimated 80,000 metric tons (the equivalent of 500 Jumbo Jets). Moreover, it is increasing exponentially and much faster than in surrounding waters. Annual global production of plastics has surpassed 320 million tonnes, with more produced in the last decade than ever before. Approximately 60% of the plastic produced is less dense than seawater and can float. When dumped into the ocean, surface currents and winds can transport the buoyant plastics, which are then recaptured by coastlines, degraded into smaller pieces (microplastics) by the action of sun, temperature fluctuations, waves and marine life, or lose buoyancy and sink. Some of these buoyant plastics, however, are transported away from shore and enter oceanic gyres. 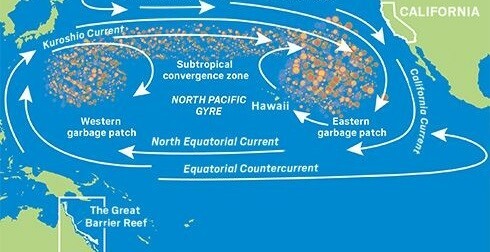 A major accumulation zone for buoyant plastic was identified in the eastern part of the North Pacific Subtropical Gyre and has come to be known as the Great Pacific Garbage Patch. Scientists from The Ocean Cleanup Foundation and six collaborating universities simultaneously drew sieve-like trawls hundreds of miles across the GPGP surface collecting 1.2 million plastic samples. Their paths were geo-referenced from the air. Of all samples collected, 99.9% were plastics. They found that 92% of the mass contained larger objects while microplastics made up only 8% of the mass but 94% of the pieces. They estimate that 52% of the GPGP plastic mass consisted of fishing gear (nets, ropes and lines) and that 86% of the 42k tonnes contribution of megaplastics was accounted for by fishing nets. We as ocean sailors are perhaps more acutely aware of our daily overuse of plastic and man's propensity to dump trash in our oceans. This news can only remind us to redouble our efforts to recycle, reuse, and repurpose, and to avoid use of plastic whenever possible. A ray of hope shone in another report that researchers have serendipitously discovered an enzyme that can break down plastics completely into their base components rendering them completely recyclable for the first time. It's not ready for broad scale applications yet, but there is now a sense of purpose to get this into large scale use quickly.